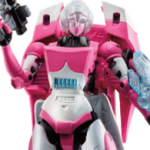 In the wake of the Fan-Built Bot poll that told Hasbro loud and clear that we want more female Transformers, the Generations toyline is getting a huge shot of robo-estrogen as new character Windblade is joined by her bestie Chromia and, to the surprise of many, a slavishly G1-accurate Arcee. 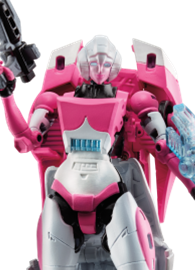 When the new Arcee toy was revealed at BotCon 2014, a lot of people were surprised that Hasbro was making that version of the character. Some said they would have preferred the newer, more relevant IDW design. The original Arcee has spent decades attached to problematic art and a dismissive view of her as a token character. But for us older women in the fandom who grew up with G1, she’s the toy we’ve wanted since we were kids.